The 2019 public forum was held on Thursday, March 14. The evening is for district and site level administrators as well as school board members to listen to ideas, accolades or concerns from patrons. Board members and administrators take notes during the forum but do not engage in dialogue and no votes are taken. However, following the forum, administrators do reach out to individuals (either by phone or email) with a response. The district recognizes that the community may be interested in the answers provided to the individuals who spoke on March 14. Richard England inquired about the district’s sibling transfer extension. Answer: As a part of the district’s secondary re-alignment in 2016 due to the opening of Heartland Middle School, there was a sibling tag-a-long that was in effect for three years. That practice was to minimize the effect of students who would have older siblings during that time at a specific high school and would want to join them. This was also to allow those students who were in a middle school feeder to the high school at the time to continue at the site if they wished to and follow their sibling. Students who were not going to qualify for the sibling tag-a-long going into middle school could stay at their then middle school without transportation, or they could go to their newly designated middle school and then matriculate to the newly assigned high school. What has occurred at this time is that the three-year sibling component of the policy is not in effect for the 2019-20 school year, and there are a few families that would like their child to attend the feeder pattern of their older children but are not able to do so. There is an exception that the superintendent of schools can exercise and allow secondary transfers. However, there have been very few exceptions granted by the superintendent during the past 3 years. These exceptions fall under mental health, special programs (special ed), student safety and other distinct issues. All exceptions to follow a sibling (without a special circumstance) have been denied. At this time, there have been no conversations at the school board level to alter the policy. Nicole McCoy asked about the counselor-student ratio at the elementary level. Answer: We currently have one counselor at each elementary site. All sites also have a school psychologist which most schools in the state do not have. We are hopeful that the 2019-20 funding we receive from the state will put more money into the formula so that we can look at all staffing schedules. Each year we look at making sure the staffing in our schools is appropriate to our needs. With the growing number of children entering our school with trauma, we are looking carefully at how we can better meet the needs of all of our children. Scott Wilke asked about Chromebooks in secondary schools. Answer: The EPS decision to issue each secondary student a Chromebook was based on the district’s mission: “Empowering all students to succeed in a changing society.” Today’s environment, whether at school, at work, or at play, definitely reflects a changing society that is particularly evident in the tools we use to communicate. By issuing our secondary students Chromebooks to use in their schoolwork, our intention is to provide a valuable, tool that provides equitable opportunity and access for all Edmond students. Certainly, we appreciate parents as our partners in teaching our shared students the necessary responsibilities and moderation required of 21st Century learners and citizens. During our first two years of implementation, we have experienced both challenges and successes. We anticipate fewer and fewer bumps as our staff (and our students) become better acquainted with the devices. Ongoing professional development will be provided for our teachers to ensure that their classroom strategies include both traditional and digital options. The Chromebooks are just one of many tools our students enjoy as members of our learning community. We can agree that teachers need to use different modalities of instruction and evaluation to increase student learning and accountability. We are appreciative of the support and trust our Edmond parents have placed in us throughout the Chromebook adoption and implementation. We would encourage any parents or students who may be experiencing difficulty with the Chromebook transition to seek assistance from their student’s teacher or site administrator. Jennifer Brooks asked about the number of nurses/health aides in our schools. Answer: Increasing the number of nurses and health aides is certainly a goal of the district. Since state finances have turned around, Edmond has added three nurses (for a total of 10) and five health aides to school sites. Additionally, we currently have seven LPNs that cover students with disabilities across the district that are medically fragile. While support personnel may be trained to perform some tasks, the school nurse has ultimate responsibility for deciding which tasks can be delegated and to whom, and for ensuring that the procedures are being done correctly (e.g., administering medications). Support personnel are trained on a regular basis regarding diabetes, seizure care, medication administration, g-tube feedings, CPR/First Aid/AED, etc. We would like to add at least another nurse and some additional health aides if the State increases our funding this year. Edmond is the 15th lowest funded school in the state out of 543 districts and only receives 70% of the state average of funding. Andrea Richardson applauded the EMHS band and its students and director. She requested that the district consider adding middle school flag corps. Answer: Currently, the middle schools lack the space, personnel, and funding to add a competitive flag corps program. The district will, however, convene with the high school band directors this spring to explore the possibilities of creating an opportunity to generate interest in flag corps among middle schoolers, prior to their enrollment in high school. Feng Ouyan spoke about the PK Lottery. Answer: We have worked hard to better meet the needs of our community and the children we serve. We are increasing the number of children we serve in PK each year as space permits. Unfortunately, being the fastest growing district in the state makes it difficult to stay up with the growth, maintain optimal class sizes and find space for the number of children desiring PK placement. Because we can not accommodate all children, we have used a lottery system for the past several years to place students in a fair and transparent manner. We hope that the construction of two new elementary schools will enable us to meet the needs of even more families in the future. Stephanie Reynolds wanted to know about getting more playground equipment at Russell Dougherty. Answer: Playground improvements and improved access to the existing playground at Russell Dougherty was a component of the 2015 bond issue. Dr. Dilg provided the district with a list of items she would like to add and/or improve in the playground area. Russell Dougherty staff members were involved at all stages of the process, including: determining site needs and requirements, equipment placement, meeting with contractors at the sites, reviewing the proposals, and making final recommendations. The total amount of the improvements made, in August of 2016, to the playground area at Russell Dougherty was $40,000. Over the past 5 years, the district has dedicated nearly a million dollars to improving playgrounds. In the past, PTO’s were wholly responsible for playground equipment purchases. Beginning in 2000, the district began including playground equipment in any new school. Playground equipment is being considered as a possible item on the next bond issue. Devyn Denton spoke about ensuring safety for sub-groups, including LGBTQ youth and minorities. Answer: EPS values the backgrounds, experiences, and cultures of all our students. An example of the diversity of our schools is reflected in the 52 different languages that are spoken in our students’ homes, and it is our goal to honor each child and his/her unique history. Every day, we work to ensure that the culture and climate of our schools support all of our students and their needs. These efforts exist in many different formats, from formal lessons within the curriculum through the reading and discussion of literature and history to extra-curricular student clubs and activities, including – among many – the Gay-Straight Alliance, Multicultural Club, and Chinese Cultural Club, as well as a student-faculty Diversity Task Force and participation in UCO’s annual Black Male Summit. Each of our schools is encouraged to develop opportunities and protocols that will best serve their particular campus while at the same time taking care to adhere to important board policies that hold all schools to the highest standards of student behavior, including policies dealing with Harassment/Intimidation/Bullying (#4420), Student Behavior (#4401), Hazing (#4560), and Safe and Healthy Schools (#4800). When an individual student or students choose to commit an act outside the expectations of policy and decency, the school administration meets them with swift and firm consequences with the ultimate goal of teaching and changing an offender’s behavior. As with so many other experiences a student might have at school, we have found that when we can work with both the student and his/her family to address a problem, we are far more successful in supporting a student as we extinguish the inappropriate actions of others and seek understanding among all the members of the school’s community of learners. Should any students ever feel threatened for any reason, they should immediately seek assistance from a trusted adult at the school. The school’s administration is charged with the safety of every student and adult in the school, and they will not rest until such a situation is resolved. Speaking on behalf of Marsha Barton, Denton relayed an incident on a bus where she described that Barton’s son was allegedly struck by another student. After reviewing the videotape of the incident and reading the discipline report that includes interviews of students involved and students who witnessed the event, we would respectfully disagree with the narrative. This is, however, a student discipline event and the district is unable to respond unless the parent would allow the release of the information. Jessica Visalli spoke about the charity weeks at the district’s high schools and her concern about some of the dares. Answer: Research on this question, including a follow-up conversation with the parent who posed the question, revealed that while there may have been questionable student dares posed some years ago, this has not been the case recently. All three schools have been refining the events of the annual charity fundraising campaigns to ensure a safe environment for all involved. The issue described at the public forum was addressed immediately; and as a result, school officials began prohibiting all dares in classrooms, stopped the students who would solicit dares in the hallways and at lunch and required all dares to be approved by administration before the fundraising week began. As to the allegation that students were forced to eat vomit and or drink out of toilets, nothing like that has ever been reported to the current, long-serving principal. We are very proud of the charitable work of our students and applaud the hundreds of hours the students, teachers, and administrators donate in the interest of giving. This year, over 1.6 million dollars was raised with no reports at any of the schools that would suggest inappropriate student behaviors were tolerated. Samantha Snyder asked about elementary school curriculum. Answer: It is true that we are in the first year of adoption for a new math curriculum. This has created a learning curve for students due to the fact they did not have this high-level, challenging curriculum in the past. The district has a succinct plan for reading intervention to meet the requirements for the third-grade reading law. Because of this law, we require documentation for reading interventions. While math is not regimented to that point, the new math curriculum does provide clear interventions to be used for a student that struggles at any point in the learning cycle. Furthermore, the district does provide a reading and math assessment that is used three times a year for all elementary students to check that learning is occurring at the rate it should. This program also allows for more frequent individual progress checks as needed. Should a student be considered at risk, the school team will create a plan utilizing interventions provided by the district. This plan will be documented and evaluated through consistent progress monitoring. Cara O’Daniel spoke about bullying in schools. Answer: Edmond’s board policy #4420 (and associated regulations in #4420R), approved in response to the School Bullying Protection Act, 70 O.S. §24-100.2, provides explicit direction for school personnel in their efforts to prevent and address harassment, intimidation, and bullying. 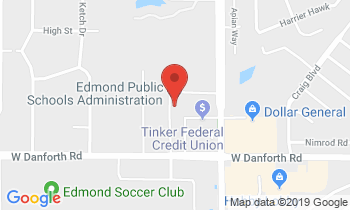 Edmond Public Schools (EPS) considers a safe school environment to be a necessary antecedent to the primary purpose of public schools, that is, a free and appropriate education for each and every child. Policy carefully delineates the procedures for addressing incidents of harassment, intimidation, and bullying or threatening behavior, giving examples of the form such behavior might include. It further describes the steps a victim should expect upon reporting an incident to a school employee, followed by recommendations for the school’s leadership to pursue. Policy even dictates occasions in which law enforcement should be involved. The deleterious effects of harassment, intimidation, and bullying, on both individuals and a whole-school climate, are considered so powerful that EPS requires every certified employee to annually review a professional development sequence on the topic. Likewise, school-wide programs and student lessons are in place at every grade level to provide a constant reminder of our school community’s expectation for a safe school environment. In addition, each school appoints and convenes a Safe School Committee that meets a minimum of twice yearly to study and make recommendations regarding unsafe conditions, strategies for students to avoid harm at school, student victimization, crime prevention, school violence, and other issues that interfere with or adversely affect the maintenance of safe schools. For any concerns related to a student(s)’ physical or emotional safety at school, on school transportation, or at a school activity, the first step is a report to the school personnel closest to the situation, most often a teacher. If the issue is not satisfactorily addressed or beyond the purview of a classroom teacher, it should be reported to a school administrator for investigation. The best outcomes, those most likely to ensure an ongoing safe and healthy environment for all involved, are enhanced when the home and school work together in harmony. That is our goal for all of the outcomes expected by state law, community trust, and district objectives; but it is particularly important in our efforts to ensure a school experience for each of our approximately 26,500 students that is free from intimidation, harassment, or bullying.